FUE i.e. Follicular Unit Extraction is a type of hair transplantation surgery in which hair follicles are individually extracted from the donor part of the body which is usually the back or sides of the head. 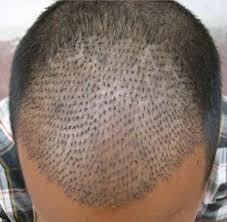 These extracted follicles are then implanted on the affected areas of pattern baldness. First the person’s scalp is examined to understand the affected area and to identify the best donor area. After this, the hair in the donor area is trimmed to identify the best and strongest hairs to pick. Individual follicles are removed with the help of a device that makes tiny incisions to help isolate the graft. These grafts are then extracted from the circular incisions with the help of a kind of tweezers. These grafts are then examined under a powerful microscope and arranged into groups of 1-4 hairs in each follicle. After examining your hair loss pattern, optimal placing is mapped on your bald spots to ensure you achieve maximum and most natural looking results. Small incisions are made in your bald spots such that they match your natural growth patterns and the grafts are placed in them one after the other. The incisions heal over a period of time and leave behind no scars. After about three months you can expect to see new hair growth and in about 6-7 months significant regrowth will be visible. The transplantation leaves behind no scars or stitches and gives you permanent, natural-looking results. It is a fairly simple outpatient procedure and anybody who undergoes it recover almost immediately and get back to work the next day.